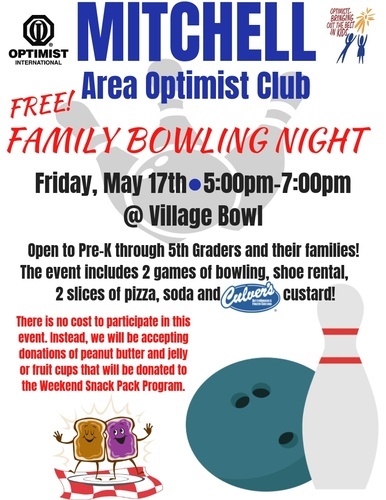 Children ages preschool thru 5th grade and their families are invited to join the Mitchell Area Optimist Club for a night of bowling. Attendees can bowl two games, enjoy pizza, soda and frozen Culver's custard free of charge from 5-7pm. The organization will be accepting peanut butter and jelly for the Mitchell Weekend Snack Pack program.